Hassiri is a Khajiit scout living with his brother, Ra'jiradh in the Talos Plaza District of the Imperial City. Along with his brother Urjabhi, Hassiri assists Ra'jiradh in running the officially sanctioned publication, The Black Horse Courier, which is distributed throughout Cyrodiil. 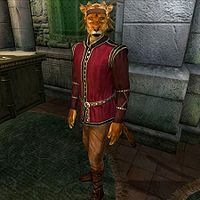 While Ra'jiradh is the busiest of the three Khajiiti running the publication, Hassiri spends most of his time in the Black Horse Courier office in the Market District. From Tirdas to Sundas, he can be found in the main reception room between 6am and 8pm, welcoming customers and wandering about. After the office closes at 8pm, the three brothers always meets up back at the Talos mansion for a four-hour dinner. On Morndas, Hassiri will start the day with a two-hour breakfast in the editorial office above the reception room. At 8am, he heads back home and wanders around until his dinner at 8pm. On Tiirdas, he will eat a similar breakfast before heading to the Imperial City Arboretum where he will spend the entire day until it is time for dinner once again. Due to the unfinished Imperial Express quest, in which the Black Horse Courier was supposed to play a big part, there are three crucial exceptions to his daily routine: At 4pm on the 1st, 10th and 20th of each month, he breaks off his routine, equips his cuirass, then runs all the way to Anvil for a brief encounter with The Count's Arms innkeeper Wilbur. He then runs all the way back to the Imperial City. If Wilbur is dead, he will simply stick to his everyday life in the big city. When he is working or wandering around in the big city, he wears a burgundy linen shirt with tan linens and a pair of quilted shoes. When the office closes at 8pm, and during his trips to Anvil, he equips a fine steel shortsword and a pair of chainmail greaves with a matching cuirass. He always carries some food, the key to the Talos Plaza house and a small amount of gold. When approached for the first time, it becomes apparent that the publication is his life: "The Black Horse Courier. Brothers Urjabhi and Ra'Jiradh, and I, Hassiri. We bring the news of the Empire to the people of the Empire! Fast, fast!" He is also the only one of the brothers that will hand you a fresh copy of the newest edition: "Here, have a copy. It's free! Always free! We're funded by the Elder Council, so I don't mind, really. He he he he." When asked about the big city, he will say: "We operate throughout the Imperial City and Cyrodiil. Very fast, very accurate. News happens? The Black Horse Courier is there!" Hassiri was supposed to sleep every night between midnight and 6am, but unfortunately, Ra'Jiradh claims ownership over the only available double bed, causing him to wander around on the ground floor all night. Esta página foi modificada pela última vez à(s) 07h17min de 1 de junho de 2015.